The Knicks, who have found strange and unusual ways to lose basketball games during a prolonged January slump, have taken defeat to a new extreme. Overtime. Make that quadruple overtime. The final score of the Knicks longest game in more than 66 years was Atlanta 142, New York 139. It was their longest game since January 23, 1951, when the Knicks lost 102-92 to the Rochester Royals in another four OT thriller. In that game at the Rochester Arena, Arnie Risen scored 26 points and Bob Davies 25 to pace the Royals (now the Sacramento Kings). Vince Boryla scored 24 points and Max Zaslofsky 19 for the Knicks. 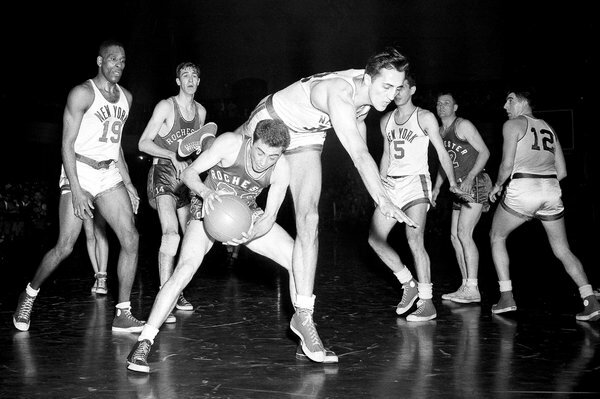 Photo above depicts Knicks-Royals action from a 1951 tilt. Less than three weeks before the quadruple overtime win over the Knicks, the Royals played an NBA record six-overtime game against the Indianapolis Olympians. The Royals won that game too, 75-73. 1951 proved to be a landmark year for the Royals. The franchise won its only championship, beating the Knicks in 7 games in the NBA Finals. The Royals took a 3-0 lead in the finals, lost the next three, then prevailed 79-75 in Game 7. 1. James Dolan — Born silver spoon in hand as heir to a Cablevision fortune, he has run the Knicks into the ground with a rash of poor personnel decisions. A recent Sports Illustrated poll named Dolan the worst owner in the NBA. The Knicks problems start at the top. 2. Phil Jackson — He won 11 rings as a coach and two more (ironically with the Knicks) as a player, but he’s been a dismal flop as president of the Knicks. Instead of stepping up as a leader and addressing the situation, Jackson left coach Jeff Hornacek to clean up the Derrick Rose mess. And the list goes on, from the hiring of ill-equipped coach Derrick Fisher, to his insistence on running the old-fashioned triangle offense to his signing of injury-prone Yannick Noah to a four-year, $72 million contract. Jackson has tarnished his legend. 3. Leadership — It starts at the top. See No. 1 James Dolan, No. 2 Phil Jackson and No. 5 Carmelo Anthony. What leadership? 4. Accountability — Without leadership, there is no accountability. Derrick Rose goes AWOL, leaves the team in limbo, and then returns to a slap on the wrist. Heck, he’d didn’t even get suspended. In fact, he’s still starting. 5. Carmelo Anthony — Leaders make those around them better players. Not the case with Carmelo, the so-called face of the Knicks. Carmelo is a great scorer, but he’s all about Carmelo. 6. Derrick Rose — Work Rule #1. If you’re not gonna be there, if you can’t make it to work that day, tell the boss. Derrick Rose had time to run off and catch a flight to Chicago, but didn’t have time to call or text the Knicks to tell them he would miss the New Orleans game. See No. 4, accountability. 7. Teaching –He’s the crown jewel of the franchise. Knick fans are pinning their hopes on Kristaps Porzingis. And yet, how’s he going to become a better basketball player if the follows the tone of the current Knicks. Who’s going to teach him low-post presence and how to play defense. There are no mentors in sight. 8. Culture — There’s a toxic atmosphere in the Knicks front office. Who can forget Isiah Thomas and the sexual harassment suit the Knicks settled out of court. The poor decisions, like multiple lottery picks for Eddy Curry. Being hosed by Denver in the Carmelo Anthony trade. See No. 1 James Dolan. 9. MSG — Playing in the world’s most famous arena actually hurts the Knicks. There’s a long list of players who seem to up their game whenever they visit New York. Michael Jordan, Kobie Bryant and Steph Curry are just a few examples. Even average players play better at Madison Square Garden. 10. History — It’s been 44 years since the Knicks won their last championship. I was in college when the Knicks last won. Now I’m on Medicare. And it ain’t happening this year either. A charter member of the NBA, the Knickerbockers have won just two titles in their history. Packers Jim Taylor rumbles in 1962 NFL Championship game at Yankee Stadium. The Giants-Packers rivalry is one of the most storied in the NFL, dating back to their first meeting in 1928, which New York won 6-0. Five times the two teams squared off for the NFL championship, with the Packers winning four, including back-to-back victories in 1961 and 1962. Five years ago, the Giants went into Lambeau Field and beat a 15-1 Green Bay squad 37-20. In 2008, the Giants beat the Packers in a 23-20 overtime thriller in frigid Green Bay to win the NFC Championship and a trip to the Super Bowl. Four of the seven post-season meetings between the two clubs were decided by a touchdown or less. The Pack won the other two via shutouts. New York and Green Bay have met 60 times including the regular season, with the Pack holding a 32-26-2 advantage. Their most recent meeting occurred last October, when the Packers won 23-16. In a see-saw battle, the Giants rallied to become the first team since the NFL split into two divisions in 1933 to win two NFL championships. The Giants took a 16-14 halftime lead before Green Bay surged in front in the third quarter on Tiny Engebresten’s 15-yard field goal. Giants halfback Hank Soar, who would later become a major league baseball umpire (he was the first base ump when Don Larsen pitched a perfect game in the 1956 World Series), carried the ball five times and caught a pass on the ensuing drive before making a leaping catch from quarterback Ed Danowski, right, for 23 yards and the winning touchdown. A championship game record crowd of 48,120 witnessed the game at New York’s Polo Grounds. Each member of the Giants teams received $900, while the losing Packers received $700 per man. Green Bay avenged its loss to New York the previous year with a resounding victory, the first shutout in championship game history. The Packers took a 7-0 lead in the first half on a 7-yard touchdown pass from Arnie Herber to Milt Gantenbein. Green Bay then pulled away with 20 points in the second half, which featured a 31-yard touchdown pass from Cecil Isbell to Joe Laws in the third quarter and a 1-yard touchdown run by Ed Jankowski in the final period. The game was moved from City Stadium in Green Bay and held at the larger Wisconsin State Fair Park in West Allis near Milwaukee. Top tickets were priced at $4.40. In a game played in the midst of World War II, Green Bay scored a pair of touchdowns in the second quarter and held on to win the NFL title. Ted Fritsch scored on a 1-yard run and then hauled in a 28-yard touchdown pass from Irv Comp to give Curly Lambeau’s visiting Packers the win. Ward Cuff scored on a 1-yard plunge in the fourth quarter for the only score for coach Steve Owens and the Giants. Giants tackle Al Blozis played in the game while on furlough. Six weeks later he was killed in battle by German machine-gun fire. His number 32 was later retired by the Giants. In the first NFL championship game ever played in Green Bay, the Packers routed the Giants to give coach Vince Lombardi the first of his five NFL titles. A total of 16 Hall of Famers, 11 of them Packers, dressed for the contest. The Packers were led by Paul Hornung, left, who scored a record-tying 19 points with a touchdown, three field goals, and four extra points. After a scoreless first quarter, Hornung, who finished with 89 yards rushing, ran for a 6-yard touchdown, the first of 24 Packers points in the second quarter. Green Bay’s defense had four interceptions, and the Giants’ offense picked up only six first downs, one by penalty. Green Bay quarterback Bart Starr passed for three touchdowns, two to tight end Ron Kramer. With the temperature in the teens and an icy wind estimated at 30 miles an hour or more, Yankee Stadium was an icebox for the players and 64,892 fans. Both teams came out with cleatless, rubber-soled shoes, and the weather put a crimp in the Giants passing attack led by quarterback Y.A. Tittle. 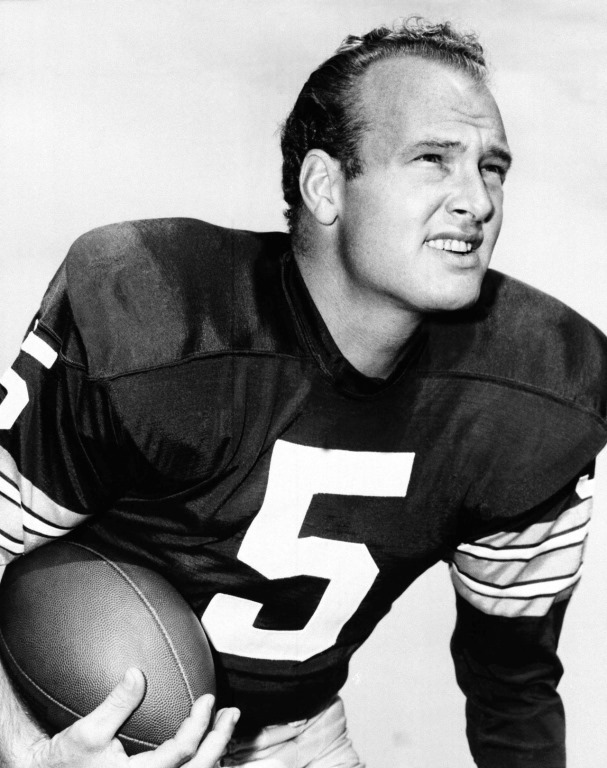 Green Bay fullback Jim Taylor led all rushers with 85 yards and scored the game’s only offensive touchdown and guard Jerry Kramer kicked three field goals to account for the Packers scoring. The Giants registered their only touchdown in the third quarter when Jim Collier recovered a blocked punt in the end zone. New York would go on to lose its third straight championship game — this one to the Chicago Bears — in 1963, before enduring 18 years of playoff futility. The Packers would win the 1965 NFL championship game, and then went on to win the first two Supers Bowls in 1966 and 1967. Following Corey Webster’s interception of a Brett Favre pass early in overtime, Lawrence Tynes, right, kicked his third field goal of the game from 47 yards out to give the Giants a hard-earned victory. Green Bay led 10-6 at the half sparked by a 90-yard touchdown pass from Favre to Donald Driver, but the Giants rebounded in the third quarter to take the lead on touchdown runs by Brandon Jacobs and Ahmad Bradshaw. Mason Crosby’s fourth quarter field goal tied the game 20-20, and Tynes missed a pair of field goals, including one at the gun, before kicking the game-winner. The Giants advanced to the Super Bowl, where they knocked off the previously unbeaten New England Patriots 17-14 to win their third Super Bowl. Eli Manning passed for 330 yards and three touchdowns, outdueling Aaron Rodgers in a divisional round upset. Hakeem Nicks caught two touchdowns, including a 66-yarder in the first quarter and a 37-yard Hail Mary pass just before halftime that gave the Giants a 20-10 lead. Manning hooked up with Mario Manningham on a four-yard TD pass in the third quarter to extend the Giants lead. Brandon Jacobs ran 14 yards for the final New York touchdown in the fourth quarter. Much like the last time, the Giants went on to beat the Patriots 21-17 in the Super Bowl. And once again, Manning and Rodgers will match up as quarterbacks.